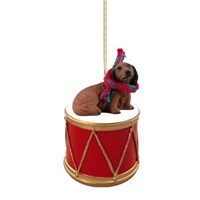 Add a touch of holiday cheer to your decor for years to come with this charming Little Drummer Longhaired Black Dachshund Christmas Ornament. The perfect stocking stuffer for everyone on your nice list, this adorable Ornament stands approximately 3-3.5 inches tall and is made to last out of durable Stone Resin. 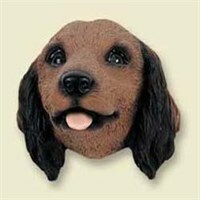 Hand Painted by skilled artisans with a fine eye for detail, friends and family will simply love receiving this Little Drummer Longhaired Black Dachshund Christmas Ornament as a thoughtful gift from you this hoiday season. 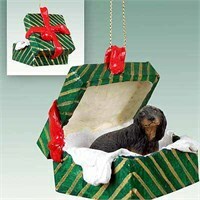 Deck your halls and trim your tree with this sweet and colorful Longhaired Dachshund Gift Box Christmas Ornament Black. 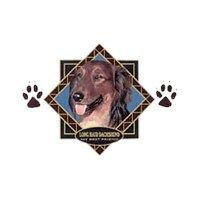 Our Longhaired Dachshund Gift Box Christmas Ornament Blacks are crafted from fine quality stone resin and feature a beautiful full color figurine. All of our Christmas ornaments are crafted for a lifetime of memories and make wonderful gifts, and these beautiful Longhaired Dachshund Gift Box Christmas Ornament Black are no exception. 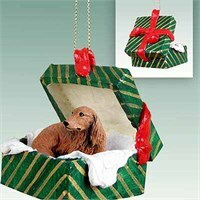 Deck your halls and trim your tree with this sweet and colorful Longhaired Dachshund Gift Box Christmas Ornament Red. 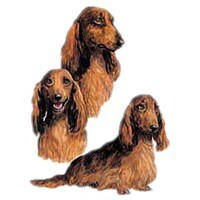 Our Longhaired Dachshund Gift Box Christmas Ornament Reds are crafted from fine quality stone resin and feature a beautiful full color figurine. All of our Christmas ornaments are crafted for a lifetime of memories and make wonderful gifts, and these beautiful Longhaired Dachshund Gift Box Christmas Ornament Red are no exception. Deck your halls and trim your tree with this sweet and colorful Longhaired Dachshund Gingerbread House Christmas Ornament Black. 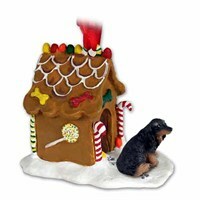 Our Longhaired Dachshund Gingerbread House Christmas Ornament Blacks are crafted from fine quality stone resin and feature a beautiful full color figurine. All of our Christmas ornaments are crafted for a lifetime of memories and make wonderful gifts, and these beautiful Longhaired Dachshund Gingerbread House Christmas Ornament Black are no exception. Deck your halls and trim your tree with this sweet and colorful Longhaired Dachshund Gingerbread House Christmas Ornament Red. 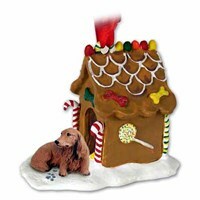 Our Longhaired Dachshund Gingerbread House Christmas Ornament Reds are crafted from fine quality stone resin and feature a beautiful full color figurine. All of our Christmas ornaments are crafted for a lifetime of memories and make wonderful gifts, and these beautiful Longhaired Dachshund Gingerbread House Christmas Ornament Red are no exception. 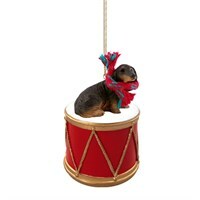 Add a touch of holiday cheer to your decor for years to come with this charming Little Drummer Longhaired Dachshund Christmas Ornament. The perfect stocking stuffer for everyone on your nice list, this adorable Ornament stands approximately 3-3.5 inches tall and is made to last out of durable Stone Resin. 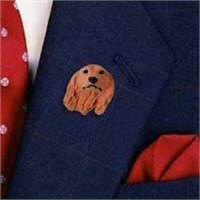 Hand Painted by skilled artisans with a fine eye for detail, friends and family will simply love receiving this Little Drummer Longhaired Dachshund Christmas Ornament as a thoughtful gift from you this hoiday season. 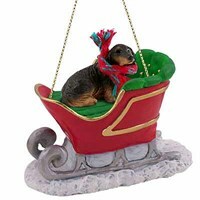 Deck your halls and trim your tree with this sweet and colorful Longhaired Dachshund Sleigh Ride Christmas Ornament Black. 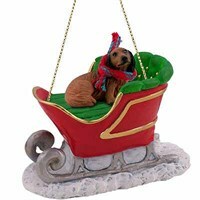 Our Longhaired Dachshund Sleigh Ride Christmas Ornament Blacks are crafted from fine quality stone resin and feature a beautiful full color figurine. All of our Christmas ornaments are crafted for a lifetime of memories and make wonderful gifts, and these beautiful Longhaired Dachshund Sleigh Ride Christmas Ornament Black are no exception. 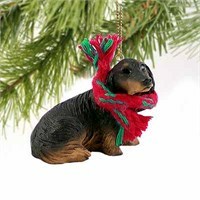 Deck your halls and trim your tree with this sweet and colorful Longhaired Dachshund Sleigh Ride Christmas Ornament Red. Our Longhaired Dachshund Sleigh Ride Christmas Ornament Reds are crafted from fine quality stone resin and feature a beautiful full color figurine. All of our Christmas ornaments are crafted for a lifetime of memories and make wonderful gifts, and these beautiful Longhaired Dachshund Sleigh Ride Christmas Ornament Red are no exception. 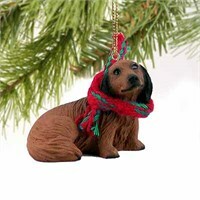 Deck your halls and trim your tree with this sweet and colorful Longhaired Dachshund Tiny One Christmas Ornament Black. Our Longhaired Dachshund Tiny One Christmas Ornament Blacks are crafted from fine quality stone resin and feature a beautiful full color figurine. All of our Christmas ornaments are crafted for a lifetime of memories and make wonderful gifts, and these beautiful Longhaired Dachshund Tiny One Christmas Ornament Black are no exception. 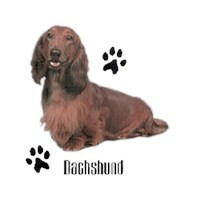 Deck your halls and trim your tree with this sweet and colorful Longhaired Dachshund Tiny One Christmas Ornament Red. 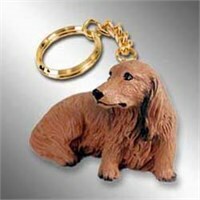 Our Longhaired Dachshund Tiny One Christmas Ornament Reds are crafted from fine quality stone resin and feature a beautiful full color figurine. All of our Christmas ornaments are crafted for a lifetime of memories and make wonderful gifts, and these beautiful Longhaired Dachshund Tiny One Christmas Ornament Red are no exception.